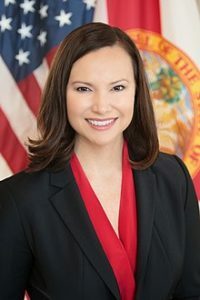 Attorney General Ashley Moody, a fifth-generation Floridian, was born and raised in Plant City, Florida. She attended the University of Florida where she earned her bachelors and masters degrees in accounting and juris doctorate. She later attended Stetson University College of Law earning a masters of law in international law. In 2018, she was elected the 38th Attorney General of Florida. General Moody joined the United States Attorney’s Office prosecuting drug, firearm, and fraud offenses. While a federal prosecutor, Ashley was commended by the DEA for prosecutorial excellence and outstanding initiative in drug law enforcement. She was also recognized by the Florida Department of Law Enforcement for her leadership of “Operation Round-Up,” a targeted prosecution of violent and repeat offenders.